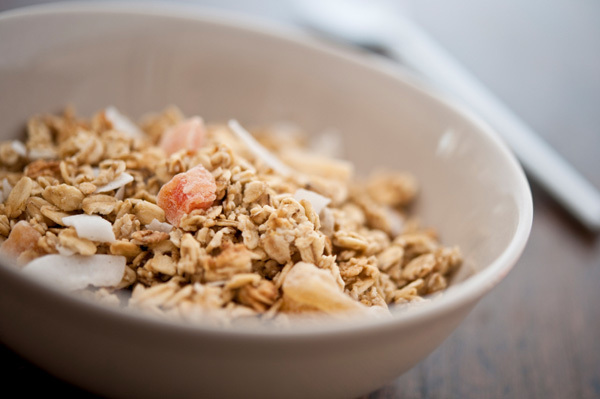 It’s common knowledge that a healthy breakfast is an important start to your day, so why not give your taste buds a treat and try homemade granola? It’s easy, tasty and, when you make it from scratch, you can control the ingredients! Granola can be a healthy breakfast or a snack any time of the day. Enoy it on its own, as a cereal with milk or add it to your yogurt and fruit for a satisfying crunch. Granola is a cinch to prepare and easy to modify to suit your own tastes. Here are two granola recipes that are sure to hit the spot. In a large bowl, mix the oats and cinnamon. In a medium bowl combine the oil, honey, sugar and vanilla. Pour the oil mixture into the oats and mix well. Spread the oat mixture evenly on the baking sheet and bake for 10 minutes. Stir occasionally. Remove from oven and mix in the almonds. Return to oven and cook for an additonal 10 to15 minutes, or until it’s fragrant and toasted. Stir occasionally. Remove from the oven and stir in the apricots, raisins and cherries. Line one or two (depending on the size) baking sheets with parchment paper or a silicone baking mat. In a large bowl, stir together the oats, oil, brown sugar and cinnamon. Mix thoroughly. Spread the oat mixture evenly on the baking sheet(s). Bake for 15 to 20 minutes, or until the mixture is lightly toasted. Stir occasionally. In a large bowl, combine the rest of the ingredients except for the raisins. Add the toasted oatmeal and mix. Return the granola to the baking sheet(s) and bake until golden brown, approximately 10 minutes. Remove from the oven, add the raisins and cool before storing.